DO YOU HAVE A CHILD WITH THE BURNING DESIRE TO PERFORM? Candy and Taran have been featured guests on numerous radio shows and podcasts. Check our media page to hear some of these informative interviews. Are you wondering what you can do to help your child fulfill this dream, but afraid of the effect of fame on your child and your family? In today’s world, with showcases, contests and reality shows, there are so many ways a child can become a star almost overnight. Because of this it’s crucial for the family to be prepared for the experiences that follow. 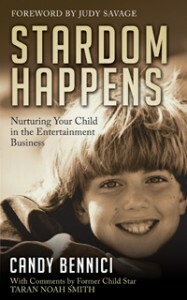 In the last twenty years many people have asked me, “How did a little kid from Marin County end up on the national hit TV show, ‘Home Improvement?’ What in the world did you do?” I have written Stardom Happens to answer that question for parents who have a child who wants to perform. I have managed three children in the business and all three were successful. 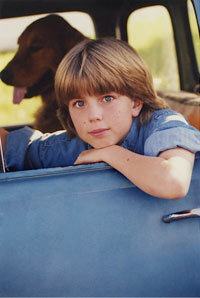 My daughter was a child model who went on to become an international model at the age of fifteen, my friend’s son became a TV and film star and my own son, Taran Noah Smith, was Mark on “Home Improvement.” All three did well, but more important, all three had a positive acting or modeling experience. When my son landed the role on “Home Improvement” my husband and I happily signed a contract for him to do the show for seven years. We had absolutely no understanding of how the business worked or how this experience would affect Taran and our whole family. We were complete novices in the very exciting and treacherous world of entertainment. By sharing my experiences managing Taran’s acting career and my daughter’s career as a model for a total of eighteen years, I feel I can provide some insight to help parents create a delightful and nurturing experience for their child. And to provide a unique perspective from the eyes of a child performer, Taran has added his comments scattered throughout the book. As parents, it’s important to help our children fulfill their dreams. We want to give them everything we can to help them succeed. Stardom Happens provides the knowledge parents need to guide their children through the experiences of performing and have everyone emerge with a positive sense of self.